New York : Duell, Sloan & Pearce, 1940. 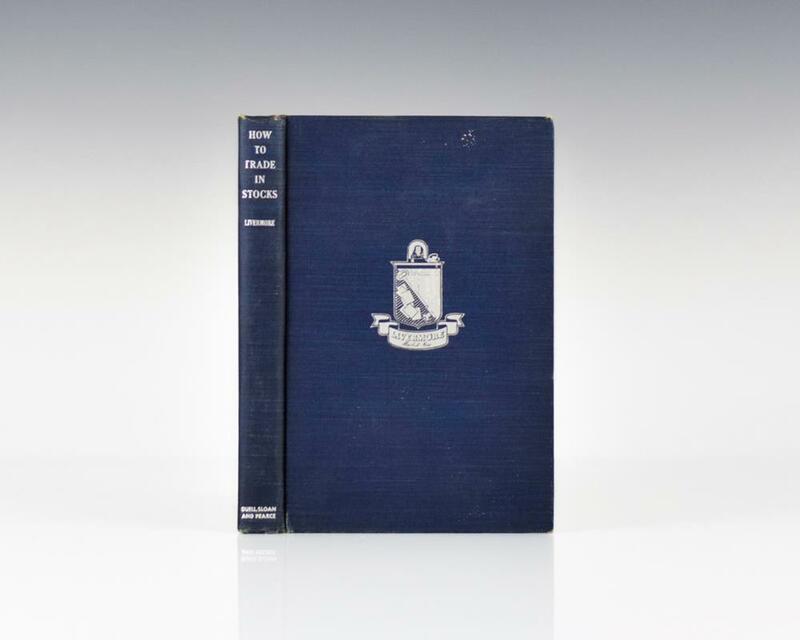 First edition of the only book by Jesse Livermore, one of Wall Street’s most well-known traders. Octavo, original blue cloth, contains 16 full color charts. Octavo, original blue cloth. In near fine condition with light shelfwear to the extremities. Housed in a custom half morocco clamshell box. Born in 1877 Jesse Livermore began working with stocks at the age of 15 when he ran away from his parents farm and took a job posting stock quotes at a Boston brokerage firm. While he was working he would jot down predictions so he could follow up on them thus testing his theories. After doing this for some time he was convinced to try his systems with real money. However since he was still young he started placing bets with local bookies on the movements of particular stocks, he proved so good at this he was eventually banned from a number of local gambling houses for winning too much and he started trading on the real exchanges. Intrigued by Livermores career, financial writer Edwin Lefevre conducted weeks of interviews with him during the early 1920s. Then, in 1923, Lefevre wrote a first-person account of a fictional trader named "Larry Livingston," who bore countless similarities to Livermore, ranging from their last names to the specific events of their trading careers. Although many traders attempted to glean the secret of Livermores success from Reminiscences, his technique was not fully elucidated until How To Trade in Stocks was published in 1940. It offers an in-depth explanation of the Livermore Formula, the trading method, still in use today, that turned Livermore into a Wall Street icon.